We all are familiar with quadcopter drones and its amazing flight maneuverability and hovering ability. The four-rotor design allowed these aircraft to perform advanced autonomous flights, which were unheard before. In reality, the concept of fully autonomous and highly agile aircraft unlocks its limitless applications. Realizing the possible commercial potential of such crafts German Company, e-Volo has developed its first two seats, 18 rotors aircraft named “Volocopter”. They produced and tested their first prototype in 2013. The aircraft manufactures stated they had fully upgraded the aircraft since 2013. The aircraft is emission free i.e. fully electrical which currently provides 20-30 minutes of flight time but the officials are working on developing hybrid power system which will enable to extend the flight time over an hour. 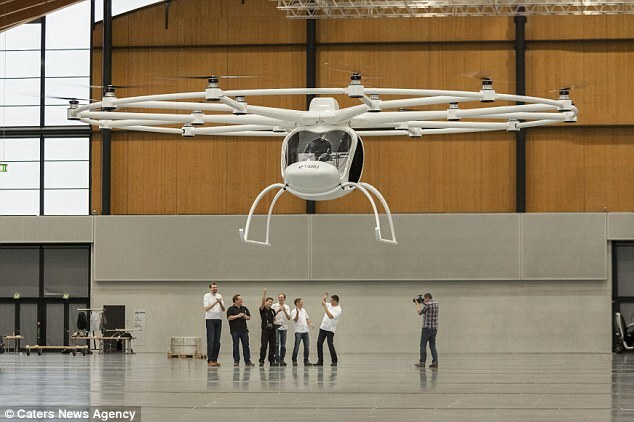 C.E.O of the company Alexander Zosel plans to sell the Volocopter for about $340,000. He said the aircraft gives significant benefit over other aircraft, the simple mechanics enables safe handling, and VTOL, the aircraft provides safe landing if even some of the rotor drives flops. The aircraft hopes to make a big debut next summer in the EAA AirVenture in Oshkosh, Wisconsin, one of the biggest air shows in the world.